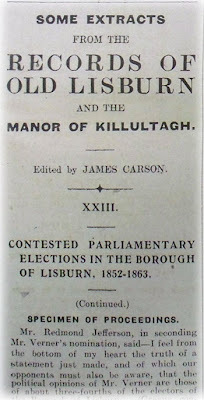 CONTESTED PARLIAMENTARY ELECTIONS IN THE BOROUGH OF LISBURN, 1852-1863. John Rea was a celebrated Belfast attorney. The "Few Observations Thereon" refer to a number of well-known Lisburn citizens, and are of such a personal and defamatory nature that no good purpose would be served in perpetuating them. EDWARD WINGFIELD VERNER, Esq. -- Proposed by Jonathan Richardson, Esquire., of Glenmore, and seconded by Mr. Redmond Jefferson, of Bow Street. JOHN DOGHERTY BARBOUR, Esq. -- Proposed by Mr. Hugh M'Call, and seconded by Mr. James Mussen. ELECTORS WHO VOTED FOR MR. VERNER. Thomas Dornan, Rev. H. Hudson, William Newill, Rev. R. L. Scott. John Backas, John Birney, James Bolton, Moses Bullick, James Ward Coulson, John Cree, Rev. R. A. Devers, Edward Johnston, Joshua Pim, Alexander M'Kinsey, Robert Thompson, Lucas Waring. John Graham, Hugh Kelly, William John Knox, William Stuart. James Allester, Alexander Downey, Andrew Johnston, Carl Klinger, George M'Cullough, Robert Cully. James Verner, Robert Willis, Carlisle Wilson, Samuel Young. Edward Boomer, William Graham, John Kinghan, David Mack, Mathew Mussen, Adam M'Clure, George M'Ilroy, Jacob Bannister, James Bell, George Bell. Henry Bell, Daniel Grant, William Henry Lavery, George Wilson. William Watson, Thomas M'Bride, Robert Munce, Hugh Kain, Arthur Gamble. John Allester, James Allen, Gilbert Armstrong, David Beatty, John Belshaw, John Boomer, James Clarke, Henry Dickey, Alexander Hanna, Thomas Harvey, William John Harvey, Thomas Jefferson, Redmond Jefferson, John Jordan, John Kain, James Lappin, Robt. Lynass, Denis Munce, David M'Night, Thomas R. Pelan, Thomas Savage, Wm. Stevenson, George Thompson, William Tumblety, William John Vaughan. Robert Bell, John Bell, Richard Breathwaite, William Galloway, William Hanna, John Hermon, William Singleton. William Dempsey, James Lappen, J. Laverty, Thomas M'Clusky, William M'Donald, Samuel Stevenson. Robert Blackburn, Joseph Blackburne, George Briggs, Robert Corbitt, James S. Dawson, John Golden, Joseph Gordon, George Hodgin, John M'Bride, Ralph Orr, James Parke. John Aicken, Thomas Johnston, Robt. Knuckle, Francis Turner, Edward Wylie. James Doyle, Patrick Gelston, John Major, William Wilson. Edward Hogg, Robert M'Cann, Charles Gribben. John Pennington, sen., John Pennington, jun. ELECTORS WHO VOTED FOR MR. BARBOUR. William Chapman, Thomas Conn, Saml. Kennedy, James Kidd, Thomas Killen, James Knox, James Millen, James Turner, David Wilson. James B. Brown, W. S. Darkin, John Doherty, James Friars, Dr. J. J. Kelso, Dr. Samuel Musgrave, Mathew M'Cloy, Robert M'Connell, Mathew J. Smyth, Dr. Wm. Thompson, James Turtle, George Wilson. Thomas Breathwaite, Joseph Bell, David Carlisle, Edward Higginson, James Mussen, Henry Nugent, John Stevenson, William Williamson, Rev. Mr. Bickerdith. Arthur Atkinson, Jos. Balmer, Peter Convery, Robert Cordner, Edward Donaghey, William Dunwoody, John Fitzpatrick, John Heaney, George Maxwell, Henry M'Gann, Hugh M'Caughey, Saml. M'Connell, Joseph M'Night, Wm. John Reynolds, Scott Hamilton, William Walsh, Peter Walsh, Henry Watson, Francis Williamson, Robert Wilson, Michael Woods, Wm. John Young. James Boyd, Dr. John Campbell, Wm. Connelly, George. Duncan, William Kenmuir, Russel Kennedy, Henry Major, Dr. Michael Meharg, John Miller, Roberts Mussen, David M'Blain, Joseph M'Clure, Thomas M'Creight, John M'Intyre, Lee M'Kinstry, Bryson Pelan, James Phillips, James Savage, Alex. Titterington, Patrick Woods, Samuel Wright, John Anderson, George Beattie, John Bell. George Carlisle, Samuel Hull, Michael Savage. John Brown, James Cairns, John Finlay, George Geoghegan, James A. Green, John K. Green, Rev. John Harkin, George Robert Hill, John King, Timothy Loughlin, John Laverty, Thomas Lavery, Arthur Macartney, Hugh M'Call, Daniel M'Lernon, Robert Reid, James Rice, John Rice, Clarke Rice, J. J. Richardson, Robert Waterhouse, George Wilson, Robt Wilson, William Young, Samuel Young. John Brownlee, William Brownlee, Patrick Mulholland. Arthur Ferris, Charles Maguire, John Orr. William Brady, sen., William Brady, jun., Thomas Donaghan, John. M'Donald, William Neill, John Phillips, Rev. Ed. Kelly. Robert Barbour, Thomas Kennedy, Robert Kennedy. James Barbour, William Barbour, Robt. Ardill. James Allister, William Johnston, J. Long, William John Magee. Alexander Richardson, Philip F. Richardson. Rev. W. Carther, Castle St. Very Rev. Dean Stannus, do. Rev. W. E. Breakey, Railway St.
Hugh Conn, Linen Hall St. Parliamentary Representation of the Borough of Lisburn and South Antrim, 1863-1917. Edward Wingfield Verner was elected as Member of Parliament for the Borough of Lisburn in 1863, and retained the seat till 1874. Sir Richard Wallace was returned unopposed in 1874 and represented Lisburn till 1886. In 1886 the Borough was absorbed in the South Division of the County of Antrim. Sir Richard did not offer himself for reelection and W. G. E. Macartney was returned unopposed for the South Antrim Parliamentary Division. He was also returned unopposed in 1892 and 1895. In 1906 Mr. Craig was returned unopposed. Mr. Craig was returned unopposed in December, 1910, and still represents the constituency. On the outbreak of the war he accepted a commission in the Royal Irish Rifles, attained the rank of captain, was wounded at the Somme July 1st 1916, taken prisoner, and is now a prisoner in Germany. In 1798 Lisburn had a troop of cavalry Volunteers as well as infantry. 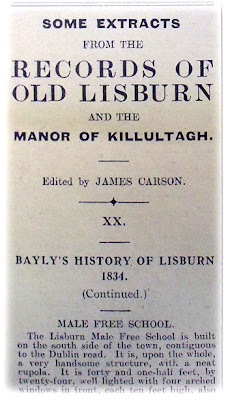 In the cavalry were many well-known Lisburn names, some of which are still associated with the town. Next Week -- King William III. in Lambeg, Lisburn and Blaris. A Voice -- Yes, there was. Great confusion and deafening uproar. "Order!" "Silence!" We are authorised to state that Lord Hertford and his Agent have strictly forbidden any party connected with the Office to interfere in the present election. Should any interference take place in opposition to those directions, we request the earliest information shall be given to us. Take Notice -- I have this morning received a Telegram from Mr. Walter Stannus stating that "the notice signed M.J. Smyth, Henry Major, Robert Kennedy is not authorised by Lord Hertford. Publish this." TO THE ELECTORS OF LISBURN. A Notice has just been posted, signed by Mr. David Beatty, attempting to contradict the one to which our names are affixed, which notice was to the effect that "Lord Hertford and his Agent had strictly forbidden any party connected with the Office to interfere in the present election." Why does not Mr. Beatty publish his telegram to Mr. Stannus and the reply verbatim? Mr. Walter Stannus, when he was asked the question, always stated plainly and distinctly "that no Office interference would be permitted," either by Lord Hertford or himself, and that every elector was at liberty to vote as he pleased at the present election, without fear of consequences. Mr. Hugh McCall, as reported in the "Whig" of a week previous, stated -- I had a few days ago a conversation with Lord Hertford's Agent, and he stated to me, and I have a letter from him to the same effect, that under no circumstance would Lord Hertford interfere in the present election. Not only so, but that he, the Agent, had called in his bailiffs to the office and told them that the first man he knew interfering with the election on one side or the other, that man would no longer have anything to do with Lord Hertford's Office. "And it will be a question for you to decide whether or not, owing to the session having almost expired, the contest should be longer continued, and should it meet your wishes, in order to prevent a continuation of riot and such ebullition of sectarian feeling, that I should resign, hereby pledge myself to go forward at the next general election, and there enforce by all lawful means my claim to the honour of representing you in Parliament." From "Belfast News-Letter," February, 1863. In fact the mysterious disappearance of voters became so general that it ceased at last to excite astonishment. An elector put up his shutters at night without being able to say whether or not he would find himself at home the next morning. So general had this system become that it is very doubtful if on the night of the nomination very much more than one half of the voters slept at their own homes. As the day of election approached the Constabulary was reinforced by about 300 men and three stipendiary magistrates. Detachments from the 19th and 62nd Regiments and two troops of Hussars were drafted into the town. Never in the history of political contests in Lisburn had the struggle been so determined. There were two polling booths, and in them during, the greater part of the day pandemonium reigned unrestrained. The poll closed at 5 o'clock, and fortunately for the peace and safety of the town rain fell in torrents, and continued to fall all through the evening and night. Coulson's Factory, M'Creight's Hotel, C. Maguire's house, etc., etc., were wrecked. From "Northern Whig," February 13, 1883. The arrangements made for the preservation of the peace on the day of the poll were all that could be desired, and he must have been a very enthusiastic Tory indeed who on witnessing the great array of Military and Constabulary in Lisburn could have reckoned on the carrying of the election by storm. There were altogether nearly 1,000 men under arms, and with such a force in a small town it would have been sheer madness to attempt to impede the electors on their way to the polling-booths. However, all the precautions taken were necessary. Train after train from Belfast was crowded with enthusiastic partisans of the Conservative candidate, supplied with tickets at the Railway steps in Belfast by a well-known local character, and who roared lustily at the top of their voices, "Verner for ever!" Upwards of 2,000 persons left Belfast on Saturday morning for Lisburn, and their object can easily be conceived when in all probability, in the whole batch, there was not a vote even for Verner. The "Belfast News-Letter" espoused the cause of "the Office" nominee; the "Whig" that of the Independent candidates. Both papers, as was the Custom in those days, championed their men in a whole-hearted and thorough manner. Nothing was left to the imagination in regard to the failings, delinquencies and general unfitness of an opponent or of the cause he advocated. ACCOUNT OF POLLING AND DECLARATION OF POLL. "Northern Whig," February 23 and 24, 1863. "Belfast News-Letter," March 14, 1863. "Northern Whig," March 16, 1863. Copy of Petition against Mr. Barbour's return, signed by the two Lisburn electors. The Petition is in the usual form, as to sets, by the Candidate, his Agents, or others on his behalf, etc., etc. After some time he and his friends appear to have lost their nerve and become frightened at the action they had taken, and a withdrawal of the Petition was procured. The withdrawal, however, did not take effect. The final result was that on June 6, 1863. Mr. Barbour was declared as "not duly elected for the borough," etc. The House of Commons, however, refused to give costs in the hearing of the Petition as against Mr. Barbour. "Belfast News-Letter," May 20, 1883. "Belfast News-Letter," May 1, 1863. "Northern Whig," May 1, 1883. Examination before Committee of House of Commons re the Petition and Breach of Privilege. This arose out of the proposed withdrawal of the Petition. Principal witnesses examined -- Alexander M'Cann. Moses Bullick, W. J. Knox, William Barbour. "Belfast News-Letter," June 8, 1863. "Northern Whig," June 6 and 8, 1863. Proceedings before Committee of House of Commons re the Petition. The "Northern Whig" gives a very full report. "Northern Whig," June 8, 1863. Leading article on the finding of the Committee. Reference to the fight for independence in Lisburn, 1852-1863. "Belfast News-Letter," April 10, 1863. Complimentary dinner to Edward Wingfield Verner, in the Assembly Rooms, Lisburn. Jonathan Richardson, Glenmore, in the chair. The list of names of those present occupies a third of a column of the paper. ELECTORS OF THE BOROUGH OF LISBURN. Now or never! Look to France and be Free! Brass Money and wooden shoes! Your Independence is at stake! Your Franchise is in jeopardy! I'll name three good men, -- good men and true -- choose for yourselves:-- first comes Mr. Johnny M'I--tyre, a man "full of wise saws," a chip of the old block, and, tho' not having a seat in the Cabinet, allowed by all to be a first-rate "Cabinet"-maker, and altho' he has frequently been "chiselled" by the "Board of Trade,' firmly declares that he will not suffer himself to be made a "tool" of by any one. "The next that does come in" is Mr. John H--on, a man who has handled many a "grave" subject, and you may rely that any "measure" he "undertakes" shall be duly "carried out" if not on his own, on the shoulders of others. On investigation his dealings will be found to be "plane" and "above board" and as things are now "going" may be said to be a "rising" man. The last that I shall mention is Mr. Arthur F--lay, a gentleman well known in sporting circles and of long standing on the turf, in whom is allied the happy "knack" of "disposing" of any "subject" that is laid before him in the shortest possible space, together with that firmness of purpose and "flay" -- grant determination which cannot fail to "garron"-tee him a crowd of admirers. You will find him ever at his "post," "a Free Trader" in heart; none need apply to him for "Protection," as he has ocular "intestine" demonstration' of the injurious working of the "Corn Laws;" and lastly his attention to your interests will be unremitting, from the fact of his being seldom, if ever, "Horse de Combat;" and should the other respectable gentlemen "decline," I have no doubt but that he will accede to your wishes should a depitation of five of the "Neigh"-bouring gentry wait on him for that purpose. The above gentlemen disown all "moral turpitude," "baseness of feeling," or any want of Independent Spirit." So ended eleven years of intense political strife in the Borough of Lisburn. The result of the 1852 election was simply a declaration of the inhabitants of the town that the state, of affairs which had existed for so many years must cease. Previous to this Lord Hertford nominated the member, and the electors obediently elected him. The return of Mr. Roger Johnson Smyth was a breaking away from old traditions and customs and a declaration of independence on the part of the electors. The political opinions of Mr. Smyth were in the main identical with those of Mr. Inglis, "the Office" candidate. The electors had no fault to find with Mr. Inglis save only that he was Lord Hertford's, nominee. They preferred to elect a man of their own choice, and once and for all to assert their independence and right to vote as their conscience dictated. The same may be said of the two following elections. The 1863 election, however, stands on a somewhat different footing. Lord Hertford and his satellites had grown weary of the struggle, and were disposed, to a certain extent, to recognise the situation as it was. They felt and saw that the growing spirit of the age, the march of independent thought, could no longer be stemmed. They wisely but reluctantly, very reluctantly, decided to submit to the inevitable. They decided in regard to this election to take up a position of non-interference. In the 1863 election the politics of the two Candidates were clearly defined -- Liberal and Conservative. The Liberal -- Mr. Barbour -- based his claims on the constituency on his local connection and local interests; the Conservative -- Mr. Verner -- on his politics. The Liberal candidate, it must be conceded, did not receive all the support and consideration his local connection and position might have entitled him to expect. It is safe to state that the contest was one of the fiercest ever waged in the constituency. The methods used by both sides, even according to the somewhat lax code of the time, were crude and unscrupulous. Victor and vanquished have now passed into the "great silence." They fought the fight according to their lights. Such a contest, conducted on similar lines, has not been fought since, and it is to be hoped Lisburn may never see the like again. Robert Barbour decided to contest the vacant seat with Mr. Verner. His election address appeared in the "Whig," June 17, 1863. He withdrew, however, on the 25th of the same month in favour of J. J. Richardson, The Island. In the "Whig," June 26 and 27, may be seen an account of the polling and declaration. Result -- Verner 151, Richardson 90. Mr. Verner continued to represent the Borough till 1874, when he was succeeded by Sir Richard Wallace. The files of the "Belfast News-Letter" and "Northern Whig" may be seen in the Linen Hall Library, Belfast, or in the offices of the respective papers. List of Voters next week. 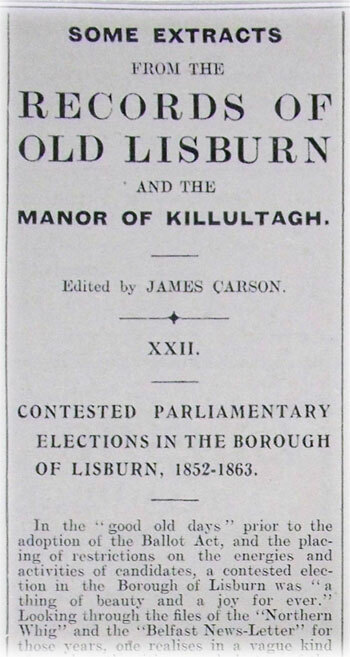 In the "good old days" prior to the adoption of the Ballot Act, and the placing of restrictions on the energies and activities of candidates, a contested election in the Borough of Lisburn was "a thing of beauty and a joy for ever." Looking through the files of the "Northern Whig" and the "Belfast News-Letter" for those years, one realises in a vague kind of way how the citizens and electors of the good Town of Lisnagarvey enjoyed a contested election. They went into it with an enthusiasm and whole-hearted zest that is difficult to understand in this year of grace 1917. Broken heads, wrecked houses, kidnapping, coercion, bribery, mob-law, faction fights, turbulent meetings, these and much more of the same kind were the gentle arts practised, and, strange as it may appear, appreciated and enjoyed by all concerned. FROM "SOME RECOLLECTIONS OF HUGH McCALL," Lisburn, 1899. On the 10th May, 1850, the first meeting was held in Lisburn in support of the claim of the tenants to what was called "tenant-right." The tenants were as absolutely in the power of the agent as they had been a century before, and no tenant dared to exercise any right as an elector, or as a candidate, without first obtaining the permission of "the office" or running the risk of being turned out of his holding. After many meetings of his friends, Mr. Roger Johnson Smyth was prevailed upon to become the Independent candidate. Mr. McCall always looked back with considerable pride to the effort that he made to call forth the Independent spirit in Lisburn, and to secure, as the Independent electors did secure, the return of Mr. Roger Johnson Smyth in December, 1852. On the 13th December on article appearing in the London "Times" describing this election in Lisburn, and describing it truly as the decline and fall of the territorial influence in Ulster. From the "Northern Whig," December 2, 1852. Dean Stannus in a letter to the "Chronicle" states that Lord Hertford is "most anxious for the return of Mr. Inglis," and that the result of this election will "prove to his Lordship whom he may regard as his true friends in and his future relations with this town." The article goes on to say -- The plain inference being that in Mr. Stannus' belief his Lordship will regard as his enemies all who do not support Mr. Inglis. Such a friend as Dean Stannus, is more ruinous to Mr. Inglis than a score of avowed friends of Mr. Smyth. But the Dean is fairly outdone by another writer in the "Chronicle," who in the midst of much raving about "high and holy principles," calls upon the constituency to do nothing that may be an affront to Lord Hertford or may vex Dean Stannus. But both the Dean and his friend are outshone in their reverence for "the office" by a rev. gentleman of Lisburn, who, if his speech on the occasion of this contest is accurately reported, declared that God had placed Lord Hertford over the people of Lisburn "in matters political," an assertion which, if the rev. gentlemen had any proof to support it with, would certainly settle the whole question. From the "Whig," December 9, 1852. Jonathan Joseph Richardson, The Island, in moving the nomination of Mr. Smyth said:-- I have the honour to rise to propose as a candidate for the representation of this Borough the first man who since 1786 has solicited the suffrage of the electors without having obtained the consent of the Lord of the Soil, etc., etc. From an early hour in the morning, the excitement of the approaching contest took a much greater tone of reality, not only by the serried columns of military -- horse and foot -- which entered the town in all "pomp and circumstance." but also by the bands of the mobocracy which perambulated the streets, calling for "Smyth" or "Inglis" "to the rescue." The military force comprised 150 men of the 46th Regiment, one troop of the 16th Lancers, and a large body of Constabulary. A body of men armed with bludgeons, from the premises of Jonathan Richardson, Ingram, took possession of the ground in front of the Courthouse, the place of nomination. Soon, however, a large body of Mr. Smyth's supporters appeared on the scene, and a furious struggle ensued, the police coming up and forming a line between the parties. This first brush had scarcely concluded when another body of Mr. Inglis's friends, supplied of course with "argumentative" bludgeons, and stated to be "retainers" of the Hertford Estate, also presented themselves on the scene of contest, but were ultimately driven from the field. About half-past ten o'clock the doors of the Courthouse were thrown open, and Mr. W. Gregg, J.P., Seneschal, took his seat on the Bench. Among those present were:-- Roger J. Smyth, John Inglis, Jonathan Joseph Richardson. The Island; Jonathan Richardson, J.P., Ingram; Redmond Jefferson, Jonathan J. Richardson, Glenmore; J. Coulson, Henry Seeds, J. Bannister, George Pelan, Wm. Johnson, J. Gray, John Millar, J. Bruce, John Hitchcock, A. Johnson, T. M'Creight, Dr. Campbell, T. C. M'Keown, J. M'Intyre, C. Bruce, J.P.; J. Harvey. Geo. Duncan, P. Woods, J. Mussen, J. Lynn, Geo. Bell, S. Kennedy, John Birney, David Beatty, J. Pennington, F. O'Flaherty, L. Waring, W. Coulson, D. Mack, Matthew Smyth, J. Boomer, Hugh Seeds, W. Whitla, etc. For a considerable time after the Court had been formally opened the Seneschal appealed in vain for a hearing. Jonathan Joseph Richardson, The Island, proposed Mr. Smyth. Jonathan Richardson, Ingram, proposed Mr. Inglis. Both proceeded to address the meeting together and neither would give way. Wild and furious uproar raged around the Seneschal. At the same time, at the entrance to the hall and on the street the factions fought with unholy glee, and blows of no gentle nature were given and taken in quick succession. James Coulson seconded the nomination of Mr. Inglis; Redmond Jefferson that of Mr. Smyth. Wild confusion and uproar characterised the whole meeting, an account of which occupies two columns. On the evening previous to the election huge number of bludgeonmen from the neighbourhood of Ballymacarrett came up to Lisburn, but they were wet by a fully equal force of the other side, who not only scattered what they considered the not legitimate supporters of freedom of election, but chased them out of the town. The political opinions of Mr. Inglis are in the main identical with those of Mr. Johnson Smyth, and he will owe his defeat to the honourable determination of the electors of Lisburn not to be represented by a gentleman brought forward under Lord Hertford's influence. The electors of Mr. Smyth profess to ground their preference of their man on no other merit which he could boast of over his opponent than on the special and most desirable merit of being entirely destitute of the influence of the family whose will has hitherto given Members of Parliament to Lisburn. In returning Mr. Smyth they have asserted the independence of the Borough. They had to make their choice between two Conservative candidates, and they do not profess to have chosen the one who is the more liberal of the two in general politics or the man of greater abilities or higher character. Mr. Smyth polled 99 votes, Mr. Inglis 81: Majority for Mr. Smyth 12. On December 29 a banquet was given in the Queen's Arms Hotel, Lisburn, to Mr. Roger Johnson Smyth. M.P., Castle Street, Lisburn. Upwards of 160 gentlemen sat down to dinner. Chairman, Captain Bolton. Speakers -- John Millar, R. J. Smyth, M.P. ; Thomas J. Smyth, J.P.; Redmond Jefferson, Edward A. Stott, Geo. Stephenson, Geo. Pelan, J. J. Richardson, The Island; Hugh McCall, H. Major, H. Seeds, T. M'Creight. The battle of independence was soon to be fought again. Mr. Roger Johnson Smyth died in the year succeeding his election, and Mr. Jonathan Joseph Richardson was selected as his successor. In the "Northern Whig" of the 3rd September, 1853, there is a report of a meeting held in support of Mr. J. J. Richardson. The intimidation exercised by "the Office" against the tenants was there denounced in terms no doubt strong, but not stronger than the oppression merited, On the 13th October, 1853, Mr. Richardson was returned at the head of the poll -- the first member of the Society of Friends who had been returned for an Irish constituency. In this contest Mr. Jonathan Richardson, of Lambeg, was returned. 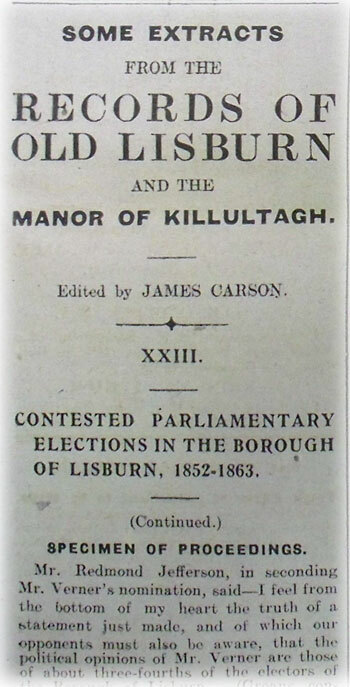 In the "Whig" of April 28 and April 30, 1857, the report of this election shows the struggle which was then going on in Lisburn, and the sacrifices that had been made by those supporting the cause of electoral independence. 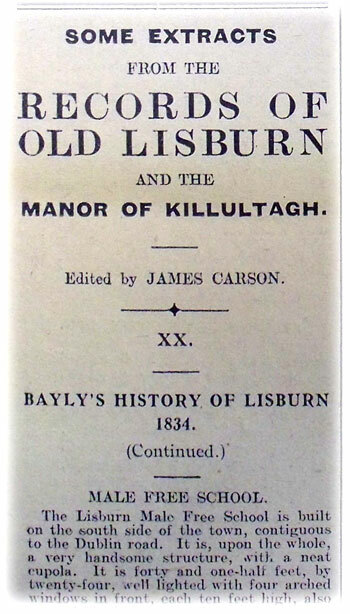 In the year 1863 another election occurred in Lisburn. Mr. Jonathan Richardson retired, and Mr. John D. Barbour came forward as the candidate of the Independent party. The battle that was fought, and the victory that was won, are recorded in the columns of the "Whig." But the triumph was short lived. Mr. John D. Barbour was unseated on petition, and the representative of "the Office," Mr. Edward Wingfield Verner, was, elected, and remained member for for Lisburn until, on the death of Lord Hertford, Sir Richard Wallace became the owner of the Hertford Estate. 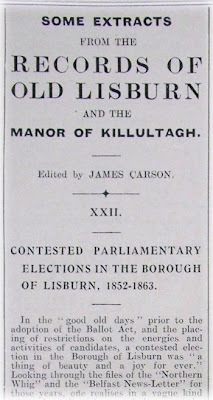 We, the undersigned Electors of the Borough of Lisburn, having in remembrance the riotous and turbulent conduct pursued at the late Elections for the Borough, whereby much injury Was inflicted on both Persons and Property, and a heavy charge laid on the Ratepayers of the Town, have determined not to support or Vote for any Candidate at the ensuing Election who may, directly or indirectly, by himself or his Agents, introduce or employ any Mob, or encourage Drunkenness, or permit any of his adherents, so far as in him lies, to molest, or disturb any Elector, or injure his property. T. J. Smyth. John Millar. H. W. Reilly, Printer, Lisburn. Quite ricketty too -- and his blood turned to serum. He's not the right man nor in the right place." For having so frequently turned his coat. Thought it clearly our duty to deal with the case. But he'd torture him first with the boot and thumbscrew. And cry mea culpa each time he should meet him!" And shouts of "No Hogg, either bigger or We--ir." And ne'er let him enter the Borough again." With his friend who spoke last or Elector M--ee. His counsel, at once, was -- to put him to death. So I'd hang him in Smithfield upon a crossbeam." "I'll skin him and sell David B--y his hide;"
And I'll scald him to death in a furnace of lye." Committed political felo de se. EXTRACT FROM SPEECH BY JOHN D. BARBOUR AT HIS NOMINATION. From "Belfast Newt-Letter," 19th February, 1863. Gentlemen, -- I am no stranger to you, and, as so much is said about family matters and family claims, I think I may venture to say that my family are no strangers to Lisburn. Since I first addressed you, on the retirement of our late respected member, I have been accused by my opponents with being a Radical. At this time of day I need scarcely tell you that I am no Radical, and never was one. It has also been attempted to cast doubts on my Protestantism. You all know I have been brought up a Protestant. This fact is known to you all from personal observation, and this sectarian cry is as false as it is futile. I would not wish to enter Parliament either as a religious bigot or as a political tool, but to give my and what is just and right -- for what will best advance the true interests of the country at large and my own town in particular. I rest my claims mainly on my local connection with you. . . I come before you on independent grounds -- to ask your independent support. I think Lisburn is entitled to local representative. . . I have no personal ends to serve in going into Parliament. I am ambitious of representing my native town, but I expect neither place nor profit for myself or my friends. Extracts from the "Northern Whig,"
The greatest activity of preparation was displayed on both sides during the day, Mr. Barbour's committee resting confident on the eve of the nomination day that, if promises be kept and votes recorded, the popular candidate will be far the highest on the poll before twelve o'clock on Saturday, and will so remain until the close. In Belfast last night an agent of Mr. Barbour was savagely assaulted by a man connected with the opposite party. It is known that several of Mr. Barbour's supporters are secreted in a certain hotel in town. The gentleman inferred to went last night into the hotel for a short time and on coming out he was followed by a man, who struck him down by a blow from a heavy bludgeon. He was so severely wounded on the head, face and hands that it was with difficulty that he could walk. He was conveyed to his home. The wounds are of a serious nature. The perpetrator is known. The nomination of candidates took place at ten o'clock. An imposing force of police and military -- horse and foot -- was in Lisburn long before that hour, and by nine o'clock the approaches to the Courthouse, in Castle Street, were lined with Constabulary, who, assisted by patrols of Mounted Police and Dragoons, most efficiently kept the peace. Messrs. R. Barbour, W. J. Smyth, Philip Richardson, Hugh M'Call, John Millar, Kennedy, J. Mussen, Major, Duncan, Turner, Corken, R. Mussen, Young, Finlay, Brownlee, Dr. M'Harg, Dr. Kelso, Titterington, Dr. Campbell, etc., accompanied Mr. Barbour to the Courthouse. Mr. Verner was accompanied by his father, Sir William, Mr. Richardson, Glenmore; Redmond Jefferson, C. H. Ward, M'Neilie, Langtry, Pennington, Crossley, Waring, Graham, David Beatty, etc. After a short delay, during which the ticket-holders were admitted, the crowd poured in with vociferous shouts and in high excitement. Mr. Hugh M'Call, in proposing Mr. Barbour, made a lengthy speech which was continuously interrupted. He spoke at times amid the wildest uproar. Order having been partially restored, the police prevented any other parties from entering, the Courthouse being completely crammed. The shouting of the crowd in the house being a mere echo of the vast multitude on the streets, vociferating "Barbour for ever!" "Barbour for Lisburn!" "Verner for ever!" 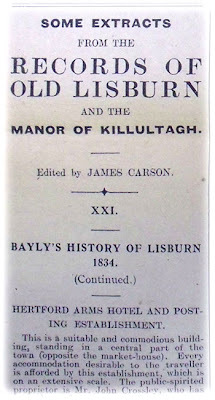 BAYLY'S HISTORY OF LISBURN 1834. HERTFORD ARMS HOTEL AND POSTING ESTABLISHMENT. This is a suitable and commodious building, standing in a central part of the town (opposite the market-house). Every accommodation desirable to the traveller is afforded by this establishment, which is on an extensive scale. The public-spirited proprietor is Mr. John Crossley, who has recently made many excellent improvements about the concern, and been at considerable expense in the posting establishment. Since Mr. Crossley's entrance into business, he has always evinced the liveliest desire and attention towards the accommodation of the public, and has spared no expense to make this concern worthy that respectable patronage which it has so long obtained. The Killulta Hunt dine together here three times during the season. A four-horse coach leaves this Inn for Belfast every morning at ten o'clock a.m. and returns at six same evening. On Sundays, a coach starts at eight o'clock a.m., returns at eleven a.m., starts again at five p.m., and comes home at eight p.m. The fare from Lisburn to Belfast by these, and all other conveyances in town, is only sixpence, which for the distance (nearly seven miles) is certainly not immoderate. KING'S ARMS HOTEL AND POSTING ESTABLISHMENT. This concern has been established nearly a century, and is the oldest in Lisburn. It is on an extensive scale, and always remarkable for affording the best of fare to the traveller. That respectable character, for accommodation and utility, which so long secured this establishment public patronage, has been still maintained by its present public-spirited proprietor, Mr. George Moore, for nearly thirty years, whose courtesy and attention has uniformly acquired him the esteem of all those with whom he has had any dealings. Mr. Moore has recently made considerable additions and improvements about the concern. Two four-horse coaches leave this Inn for Belfast, one at nine and the other at ten o'clock every morning of week days, returning at five and six p.m., and on Sundays a coach starts at eight, and returns at eleven a.m., starts again at five, and returns at eight p.m. There are several minor Inns in Lisburn which afford as good accommodation as any of the kind in Ireland. The proprietors are always obliging, and, generally speaking, quite inn-dependent men. Jaunting cars, and other conveyances, start every morning from Lisburn to Belfast, from Mr. Lawson's, Mr. Boomer's, Mr. Mooney's, and Mr. Savage's, so that one can seldom be at a loss for a conveyance, and at a most trifling expense. Much of this accommodation is owing to the enterprising spirit of the late Mr. John M'Coy, who first tried the experiment (some twenty years ago) whether any public carriage could exist without the advantage of conveying the mail, and in opposition to it; he plainly proved it could be done; but being killed by a fall from his own coach, he left others to reap the advantage of his attempt; and no man in his station was ever more and deservedly lamented. The late Mr. James Williamson was the benevolent founder of those beautiful little dwelling-houses, a short distance from town, on the new Belfast road. They were erected in 1826, by a legacy of £100 bequeathed by that individual. The ground was given by Lord Hertford, with a donation of £40. Hilden is very pleasantly situated in the vicinity of Lisburn, and is the seat of a Thread Manufactory, the property of Mr. William Barbour. It was established by his father, the late Mr. John Barbour, a native of Scotland, who had the merit of founding this branch of trade on the Hertford estate. Hitherto, to the great discredit of our country, Ireland has been a depot for Scotch thread; but in consequence of the spirited example set by Mr. Barbour, we are no longer dependent on a foreign market for a supply of this useful article. Here upwards of two hundred thousand hanks of native yarn are spun annually into threads of all classes. Upwards of three hundred persons are employed at this concern in preparing, coloring, dying, bleaching, and making threads. There is also a manufactory of reticules. Whether, therefore, we regard this factory in its relation to the trade of Ireland, or as an establishment conducing to the improvement and prosperity of the Hertford estate, in either of these relations it has a just claim to public notice. The dwelling-house here is a very fine structure, and which, with the bleach-green, form a very picturesque feature in the surrounding beautiful landscape. Mr. Barbour has recently built several houses in this neighbourhood for the use of his workers. This is a very extensive concern, the property of Mr. Samuel Kennedy of Lisburn, and remarkable for the excellent quality of the flour which it produces. Mr. K. has expended many hundred pounds on this property in various repairs and improvements, although he has no lease; but the characteristic conduct of Lord Hertford in all such cases, fully justifies the confidence reposed in the honour and justice of his family. A Public Bakery was established in 1832, by the gentry of the town, for the purpose or preventing monopoly, and supplying the inhabitants with bread, superior in quality and quantity than was hitherto supplied. This establishment bakes, on an average, twenty bags of flour in a week. The fitting up of this concern cost upwards of £180. On an island formed by the canal and river Lagan, in the immediate vicinity of the town, there is an extensive Vitriol Manufactory, the property of Messrs. Boyd. A lofty brick chimney overtops the works, carrying off any noxious gases. The dwelling-house is a neat structure. It is surrounded by a wall in the castellated style; and from the County Antrim side of the river, has somewhat the appearance of a fortress. This handsome seat is situate to the eastward of Lisburn, immediately adjoining the town; in its neighbourhood is the ancient burying-ground of Kilrush, on the banks of the Lagan. It is the residence of Mrs. Casement, to whom it belongs. The dwelling-house is large and commodious, and all around it characteristic of taste and neatness. The grounds are well laid out, and are kept in good order. Within the last few years considerable improvements have been made. The flower garden has very justly gained universal admiration, and reflects credit on the refined taste of the owner. A picturesque view of the town and river in the distance, is obtained from the road leading to this villa. Although the bounds are very circumscribed, it is said to be the largest holding in perpetuity on Lord Hertford's estate. This Hunt, which is at present in a very prosperous state, was established in 1832, the Marquis of Hertford having, in the kindest manner, given to the members the privilege of hunting over some of the best ground in the north of Ireland, on his Lordship's estates in Antrim and Down. At a meeting held at the Hertford Arms, Lisburn, on the 28th February, 1832, the following gentlemen being present:-- Mr. Gregg, Mr. Whitla, Mr. Birney, Mr. Murray. 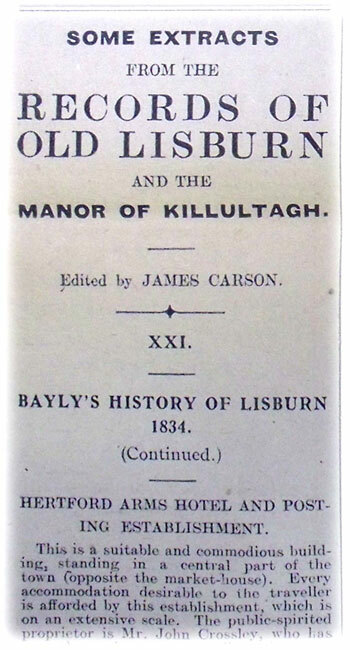 Mr. C. Boyd, Mr. J. Boyd, it was unanimously resolved -- That a Hunt be established at Lisburn, denominated, "The Killulta," to be maintained by an annual subscription of the members. The members meet on the first Tuesday in each month, at one o'clock, at the Hertford Arms Hotel, Lisburn, to appoint the places of meeting for the hounds during the month, and to transact the general business of the Hunt. The places of meeting of the hounds are named by each hunting member in succession. The hounds hunt two days in the week, vis. Wednesday and Saturday. On the north side of the town, an excellent kennel has been erected, having a stream of water running through the yards. The huntsman, besides a liberal salary, is also accommodated with a comfortable dwelling-house, garden, and stable connected with the kennel. We believe the erection of these premises cost £250. Anxious to record the names of those individuals who have distinguished themselves by their philanthropy, we take this opportunity of noticing their worthy characters, and meritorious works. 1. -- John Hancock, a native of the town, who long distinguished himself as one of its active and useful citizens, and who some years since addressed himself to the Irish public in a course of essays explanatory of his views of religious and moral truth. The Hancock family always have distinguished themselves as the friends and supporters of every useful and charitable institution in Lisburn. 2. -- The late Dr. Whiteford, whoso benevolence the inhabitants of Lisburn and its vicinity cannot easily forget. It may be truly said of him, "He came unbidden to the poor man's bed." This worthy gentleman fell a victim to his philanthropic labors in the cause of mercy and charity. He died from the contagious effects of a most violent and dangerous fever, while in attendance on a poor female patient. Doctor Whiteford afforded one of the noblest and the best examples of that devotion, heroism, and disinterestedness so characteristic of, and so extremely honorable to, the medical profession. Whatever were his religious opinions, he exemplified in his life that A humane man is the noblest work of God. 3. -- The late Mr, John Crossley, Jun., who was the first in the north of Ireland who established a School for instructing the children of the poor according to the Lancasterian system, and which he carried into effect by means of the book published on the subject by Joseph Lancaster. He continued his praiseworthy exertions to the day of his death, devoting almost his whole time to this important object. But he did not confine himself to teaching only; from the subscriptions set on foot by him. he was enabled, in numerous cases, to clothe the children, and distribute the most useful, religious, and moral tracts among the families of the poor, without excepting any religious persuasion, though he was himself a zealous member of the Established Church. His benevolence was unconfined; in short, he rendered himself to the poor a judicious teacher, an affectionate father and friend. 4. -- The late Mr. John Rogers, grocer, one of the most useful, philanthropic, and efficient citizens that Lisburn could ever boast of. He was thirty-three years in business, and during all that time he persevered in the same path of moral rectitude; and though he was in some respects of an eccentric disposition, yet charity and good feeling toward all who had poverty for their passport, were his prevailing characteristics. As the winds of the air. He was nobly distinguished by a taste for the beauties of literature, and most liberal (perhaps too much so) in lending his books, of which he had a most splendid collection. For the last ten years he was Treasurer to the Lisburn Society for the relief of the poor, a situation requiring the most zealous attention -- the duties of which he fulfilled with unwearied activity. To all the charitable institutions of his native town he was a liberal contributor. His was not the passive, smooth-tongued philanthropy so often met with in the world; but active, open-handed, and straight-forward benevolence. Death found him doing his duty. He had gone in his usual health (on the morning of New-Year's day, 1834). to the Committee-room of the Philanthropic Society, to transact business relative to the Institution, of which he was Treasurer; and in the act of settling some affairs with two of the Collectors for that Society, he expired. There is an Academy (which has been established many years in Lisburn) for the education of young ladies and gentlemen. It is kept by Mr. Benjamin Neely. Mr. Spence, the celebrated, penman, was educated at this Seminary. There is also a Seminary for young ladies, which has been recently opened by the Misses Montgomery. There are other Schools in the town, the principal of which are kept by Mr. Sheils and Mr. Thompson. Respecting the general appearance of Lisburn, it is cheerful; the streets mostly spacious, carefully paved, and always clean. Its side-paths are not flagged, but we believe it is in contemplation to do so. Another great desideratum is the lighting of the town by night. Lamps were erected in 1825, and a Mr. Whowell employed to light the streets with gas; but owing to Whowell's failure, the work has been neglected and abandoned. As a greater inconvenience to any town or public thoroughfare during the dark winter nights cannot exist than the want of lamps, we most ardently hope, for the honor and respectability of Lisburn, that this evil will be remedied as soon as possible. Since the Legislative Union, Lisburn returns but one member to Parliament -- the present member is Captain Henry Meynell, R.N., nephew of the Dowager Marchioness of Hertford -- he has been elected several times, and is a staunch Protestant. The population of Lisburn is 6202 souls. Thy beauties, Lisburn! List the stranger's lays. The good intent that fain would fire the Muse. The greenest, sweetest spot of Erin's name. Once more for her I'll string my trembling lyre. On sweeter spot can Sol or Luna beam. Than Hertford's town on Lagan's limpid stream. Such tones as never had been heard before! 'Twas wondrous strange, but now her reign is o'er. Hurl'd down old Echo -- bade her to begone! And feast their eyes at Coulson's factory. The brightest dreams that, fancy's self could frame. Like tiny fabrics of enchanted land. And Lisburn's Damask's fam'd from pole to pole. Echoes from the Elections of 1832-1863 Next Week. The Lisburn Male Free School is built on the south side of the the town, contiguous to the Dublin road. It is, upon the whole, a very handsome structure, with a neat cupola. It is forty and one-half feet, by twenty-four, well lighted with four arched windows in front, each ten feet high, also an arched window over the front door, and two windows in the rere, each eight feet high. The site and grounds of the schoolhouse, and master's house, was the gift of the Marquis of Hertford, who liberally contributed to both. The bell for the cupola, which weighs forty-three pounds, was presented by the late Rowly Hall, Esq., of Lisburn, in 1822. The school-house, yard, front gates of wrought-iron, and other appendages, cost £387 7s 7d. A few yards from the School stands a neat house for the master, the erection of which exceeded £95. Mr. William M'Cann is the present master, and has filled this situation for the long space of fourteen years, with every credit to himself, and advantage to his pupils. This excellent institution was opened on the 29th of May, 1810, by Mr. John Crossley, jun., and the Rev. Thomas Cupples, who for some time labored under many difficulties, the principal of which was the want of a suitable place to educate the objects of their care, the children of the poor. We rejoice to give publicity to the liberal legacy of £100 to the Lisburn Free School, and also £100 to the Female School, by the late George Whitla, Esq. The interest of this sum is appropriated to the purchase of clothing for the most needy of the children in attendance. From the report of this School for the past year (1833) it appears that the funds are rather low, from many of its most zealous supporters having been called off the stage of time. The number of children on the roll has increased, within the last ten years, from 170 to 250. The yearly subscriptions average from 40 to £50. This is a fine brick building, on an elevated site contiguous to the Dublin road, and forms a pleasing ornament at the entrance of the town. When the contemplated avenue is laid off, and the local appendages completed, the appearance of this edifice, in point of scenographic beauty, will be quite unique. This charitable Institution, for the reception of fever patients, was built by subscription in 1832-3. The cost was £600. The grounds were the gift of the Marquis of Hertford, who also, with his usual liberality, gave £250 towards its erection. This building stands in an airy place, on the N.W. side of the town, and was erected at the cost of Lord Hertford, in the year 1832, when the cholera (that army of disease) was committing such dreadful ravages over the country. On the occasion of this awful visitation, the usual kindness and paternal watchfulness of the Marquis of Hertford, were particularly evinced. His Lordship, without any application on the subject, gave directions that do expense should be spared in adopting every precautionary measure against its attacks -- that preventive medicines, blankets, warm clothing, and other necessary articles should be distributed throughout the whole estate, and hospitals built whatever needed, entirely at his sole cost. These directions agreeing so minutely with the philanthropic feelings of Dean Stannus, were largely and extensively acted upon; and never did his Lordship's bounty arrive so opportunely, or produce happier effects. This handsome edifice is situated on Prospect-Hill, a short distance from the town. It has an elegant avenue, and meat porter's lodge. This institution was established in consequence of a bequest from John Hancock, father of the late John Hancock, of Lisburn; the sum being increased by subscriptions from the society, enabled them to erect the present building, on a piece of ground granted them by the liberality of the present Marquis of Hertford's grandfather. John Gough, the great arithmetician, was head master of this school many years. There are at present forty-three children, who are clothed, boarded, and educated. This most excellent and commodious concern, the New Corn-Market, is conveniently situated on the S. W. of the town, by the Dublin road. It was laid out and built in the year 1826. The Marquis of Hertford very liberally gave £600, the remainder was subscribed by the Manor. In the centre is a large weigh-house, and a spacious area for corn on market days, besides a number of sheds on either side for the sale of potatoes. The Shambles were erected in the year 1796, on a rivulet in Smithfield, by the late Marquis of Hertford, but have recently been considerably improved, by the front row of shops being taken down, and a neat palisading fitted up in their stead at his Lordship's expense. This alteration adds materially to their respectable appearance, and was planned by Dean Stannus. The Meat Market usually gives a very excellent supply on Tuesdays and Saturdays. THE DIAPER AND DAMASK MANUFACTORY. That the Diaper and Damask Manufactory of Lisburn, the property of the Messrs. Goulson, is the most eminent in the world, is universally acknowledged; and now that arts and manufactures, have arisen to such a height of excellence, Irishmen in general, and the inhabitants of Lisburn in particular, should be proud to contemplate and exult in the assertion. The introduction of the Damask manufacture on an extensive scale in this country, was first accomplished by the late W. Coulson, Esq., father of the present highly-respected proprietors, who established it here in 1776. Of the incalculable advantages derived by Lisburn, from the number of individuals which this establishment keeps in constant employment, we cannot speak too highly. It holds out that best stimulus to industry -- the certainty of reward: thus fostering and strengthening the spirit of independence. Many grown-up boys who, perhaps, would otherwise be in idleness, are received as apprentices, and paid for their work; the weekly sum they thus earn is a considerable relief to their parents. Upwards of five hundred workmen, residing in and contiguous to Lisburn, are daily employed, in addition to many persons who reside at Newtownards, and the districts immediately adjoining Lisburn, viz., Drumbo, Trooperfield, Blaris, and Sprucefield; at the latter place the Messrs Coulson have a bleach-green, for finishing their own manufactures. Where the weekly sales are made, is a large square court, surrounded by a piazza of brick, and most conveniently situated, and continues to be well attended by merchants. It was erected many years ago at the expense of the late Marquis of Hertford. That which particularly contributed to the rise of the town of Lisburn, was the settlement of many French Protestant refugees here, (after the repeal of the edict of Nantz) who had been bred to the Linen Manufacture. Mr. Lewis Crommelin obtained a patent in 1699, which was afterwards renewed in the reign of Queen Anne, for establishing a manufacture of Linen; and also many other grants, one for £60 per annum for a French minister. In consequence of this he settled in Lisburn, and many of his countrymen also. The virtuous conduct and civilized manners of these good people were of great advantage to the place; and their skill and industry set an example to those who were concerned in the same business, which soon had the effect of raising the quality of their manufacture to a degree of excellence unknown till then; and the linen and cambrics made in this neighbourhood, and sold in Lisburn market, have, until this day, kept up their superior character. The most eminent Linen Merchants of the County Antrim are established in this town. The Messrs. James Nicholson Richardson and Co. are well known to the commercial world. They have a very extensive concern here, which employs a number of hands. Also Messrs. Jonathan and James Greer Richardson, who carry on the Linen business very extensively; we believe their numerous sales are chiefly confined to the English market, where the character of their cloth, in particular, is much appreciated. At the junction of the three main streets stands the market-house, a fine well-proportioned building. This useful edifice, with its handsome cupola and clock, was erected, and is kept in repair, by the Marquis of Hertford, for the accommodation of the inhabitants. It has of late undergone many improvements: a wrought-metal railing and entrance gate now surrounds it, which adds much to its appearance. A gymnasium has recently been fitted up in the lower part of the house, and a lending library (under the care of Miss Magdoline Stewart) has the convenience of one of the apartments. Over the market-house is a spacious and elegant assembly-room, where a ball was formerly held every fortnight. As the Lisburn ladies have been long proverbial for beauty, what a splendid and fashionable display must have then adorned the room! Will the days ever come, when the sound of the song and the dance shall make these walls to ring again! Will the bewitching forms -- the soul of symmetry -- and the neat foot and ancle, ever again appear in the mazy dance, when the daughters of Lisburn resembled so many sylvan goddesses, "tripping it along on light fantastic toe!" Oh! will the heaven's blush at close of day be ever again eclipsed by the virgin blushes, 'mid beauty's brilliant throng! Will the minstrel's magic ever again break forth in floods of glory, and will the soul of music ever again fling its enchantments over the lovely and the loved! Is the day far distant, when the poet and the child of song shall string the lyre with a heart of joy, and ravish the listening ear with the numbers of an Amphion or the strains of an Orpheus! Will the day soon come, when the bards of Erin shall no longer hang their harps on the willow by the banks of the limpid Lagan, or string them in silence, sorrow, and solitude, for crushed genius and neglected merit! This is a suitable building, situate in Castle-street, and is venerable for being erected on the identical site of that place of worship formerly occupied by the French Hugonot Refugees, after the repeal of the edict of Nantz, their minister being the Rev. Saumerez Dubourdieu (Mr. Peter Goyer acting as clerk). It has only recently been rebuilt, at the sole cost of the Marquis of Hertford, and is now an excellent court-house. A bench of magistrates, usually consisting of Robert Williamson, James Watson, John M'Cance, Henderson Black, and Edward Johnson, Esqrs., hold a court of petit sessions here every Tuesday, when all actions for wages, &c., cases of assault, trespass, felonies, and other misdemeanor, are heard and decided. Defendants have the privilege of appeal, in some eases, from this court to the general quarter sessions of the county; in other cases there is no appeal, as appeals from convictions of justice only lie when expressly given by the statute. Mr. Francis Hale O'Flaherty acts as register of the justices. The manor court is also held here every third Wednesday, by the seneschal, William Gregg, Esq., when all actions under the sum of £20 are heard and determined. Appeals from decrees pronounced here lie to the judges of assize. The cases of attachments are tried as records, in the same manner as at the assizes. The following are practitioners in this court: Messrs. Pennington, O'Flaherty, and Magee, Mr. Wm Dillon, Jr. Regr. The appointment of seneschal is vested in the Marquis of Hertford. On the resignation (from ill health) of our late respected Seneschal, the Rev. Snowden Cupples, D.D., the Manor presented him with an elegant piece of plate, value 50 guineas, as a small testimony of their esteem and gratitude for his uniform attention to his arduous duties, during a period of twenty-two years. The consistorial court of Down and Connor is held here every second Monday. It takes cognizance of all actions for slander, divorces, accounts of executors and administrators, tithes, &c. The judges are, the Worshipful Snowden Cupples, D.D., the Vicar-General, the Worshipful Edward Higginson, Esq., A.M., is D. Register. The proctors practicing in this court are, Messrs. Dillon, Stephenson, Pennington, and Magee. The grand jury for the manor of Killultagh assemble here twice a year, being summoned by the seneschal, and hold a court leet. They present sums for repairs of bye-roads, hedges, &c., make regulations for the town, and order nuisances to be abated and removed. Their money presentments, when confirmed by the Seneschal, are levied off the manor, with the county cess. Their Secretary is Mr. Francis H. O'Flaherty. Treasurer, Wm. Whitla. Esq. This house also accommodates a dissenting branch of the Wesleyan Methodists, as a place for worship on Sundays; the voices of praise and thanksgiving on these occasions forming a curious contrast to the boisterous pleading of the proctors on the Wednesday following. And here also the Lisburn Debating Society (which, by the bye, has died a natural death) formerly held their literary loquacious meetings, when the eloquence of Cicero or a Demosthenes echoed within its walls. Truly, Monsieur Courthouse, you are accommodating to a French degree. You have religion for your sister, and law for your brother! Farewell to the sanctified spot whore both the law and the gospel are administered!!! The Post-Office is kept by Mr. Samuel Gamble, at his residence (an excellent house) in Castle-street, the most convenient part of the town for a public office; and it is no more than justice to say, that the most admirable, regularity, care, and attention have always characterised the proceedings and management of this department, during the long period the present postmaster has held the situation. The favourite place of recreation for the inhabitants (especially the ladies) is the castle garden. It is a large pleasure ground on the one side of Castle-street, and formerly belonged to Earl Conway's noble castle, which was burned in 1707. There is an excellent terrace, affording a most agreeable promenade, and commanding a very beautiful landscape view. These grounds have been elegantly laid off with walks, shrubberies, &c., and are always kept in the best order. The fine lofty plantations (beautifully foliaged in almost all seasons) along the sides of the centre grand walk, give a majesty and sweetness to the whole. We may rail this delightful spot the Mountjoy-square of Lisburn. Dean Stannus has here made many excellent as well as tasteful improvements. Formerly a blank ugly wall inclosed it from Castle-street, over which some huge trees projected, and darkened the street so much at noon-day, that one was reminded of "the valley of the shadow of death!" The trees have been recently cut down, and the walls now superseded by an elegant line of wrought-iron railing, with three fine entrance gates, while the side-path of the street in parallel has been considerably widened. All the improvements have been made at the expense of Lord Hertford, who keeps up those pleasure-grounds for the use and recreation of the inhabitants. A man is appointed at a yearly salary, for the sole purpose of caretaker. Among the many specimens of that so much admired and valuable tree, the elm, those two which grow in the castle garden are very conspicuous: being seen towering above the town from every approach. They stand on a terrace, where the soil has been embanked and supported by a high wall. Those trees (called "the sisters") are in circumference nearly equal, being about eleven feet six inches, and carry their thickness to near twenty feet. Here was once the bower of love and courtship for the lads and lovely lasses of Lisburn. Beneath the outstretched branches of those trees, in the solemn silence of evening, often have the vows of lovers been offered up on the altar of affection. Often has the queen of night witnessed the delights of those joyous moments, when love was all in all! The County of Antrim Infirmary is a fine spacious brick edifice, having twenty-four windows in front, and is situated in an airy part of the town. This institution was established at Lisburn in the year 1767, pursuant to act of Parliament. Its object is to provide medicines, or medical or surgical aid, for the poor of the county, both male and female. This is effected in two ways, either by dispensing medicine or advice, or both, to extern patients; or by receiving them into the house, when the case requires the immediate care and superintendence of the surgeon. The number of extern patients annually relieved amounts, on an average, to 850 with medicine, and 400 with advice; and the interns to 290. The house contains 42 beds. Tuesdays and Saturdays are appropriated by the surgeon to giving advice and medicine to the extern patients. Persons paying twenty guineas become governors for life; such as pay three guineas annually, are governors for the year. Each governor is entitled to recommend ten extern patients in the quarter, for advice and medicine, and to recommend for interns whenever there is a vacancy, on certifying that the patient is a real object of charity. Recommendations of paupers for advice only, are unrestricted. A Board of governors meet quarterly, to regulate the general concerns of the Institution; and the internal management and economy of the house are placed by them under the superintendance of a weekly Committee, who make a report to the succeeding Board. Reports of the state of the Infirmary, including income and expenditure, are made annually to the Commissioners of Public Accounts, and at each Assizes to the Grand Jury of the county. The governors are declared capable, by the Act, of taking and receiving any lands, not exceeding the annual value of £200, and benefactions to any amount in personal property. The sum expended for this Institution in the year 1833 exceeded £500 -- that received towards its support, including the Marquis of Hertford's annual subscription of £46 3s 1d and Mrs. Whitla's subscription of £21, as governors for life, amounted to £480 19s 9d. The duties of the surgeon are skilfully and attentively discharged by William Stewart, Esq., M.D., aided by William Thompson, Jun., Esq., M.D., whose professional abilities and humanity eminently distinguished them. On the N. E. side-of the town stands the Female School, a very handsome, commodious edifice, with four arched windows in front. The avenue (to which you entered by a neat metal gate) is tastefully laid off in a garden-like manner. Attached to that School is a dwelling-house for the use and occupation of the mistress. This excellent institution, for the education of poor female children was established by Miss Hawkshaw, who is patroness, in the year 1821; the Marquis of Hertford having granted the ground, and paid the cost of building, &c., estimated at £400. The number of children in attendance exceeds two hundred. We must not forget mentioning the benevolent legacy of £100 for the use of this school, bequeathed by the late George Whitla, Esq., of Lisburn. This sum is placed out at interest, which goes to clothe some of the most needy of the children. This is a neat building, standing a few paces from the one just noticed. It was built by subscription in 1833, aided by a donation of £50 from Lord Hertford. The Rev. Thomas Thompson was one of its most active founders; and in the welfare of this, as well as the Boys' School, uniformly takes the most lively interest. This Institution is for the education of poor children, whose age does not exceed seven years, and is supported by the ladies of Lisburn. FREE HOUSES FOR DESTITUTE WIDOWS. These handsome houses opposite the school just noticed, were built at the expense of the Marquis of Hertford, in 1832; the cost exceeding £120. CHARITABLE SOCIETY FOR PROMOTING INDUSTRY. This excellent institution was formed about fifteen years since, by the late Rev. Thomas Higginson, the then Curate of Lisburn, under the denomination of the Lisburn Philanthropic Society -- subsequent to that period, its benevolent labors have been crowned with the most important effects. About twelve months since, a change took place the course previously pursued by the Society, and it was deemed advisable, that the system of giving aid by money should be abandoned, and a new plan adopted viz., the distribution of the funds in rations of meal, coals, &c., and the employment of the funds, as far as practicable, for the promotion of industry. The plan has been acted upon with success. The subscriptions for this Society, including Lord Hertford's very munificent annual donation of £92 6s 2d, with the interest of Rev. John Carleton's, and Messrs. Herron and Shanks's legacies, also £20 yearly from William Whitla, Esq., amount to nearly £500 per annum.